1985 was an interesting year for D&D. It saw the publication of Unearthed Arcana and Oriental Adventures. 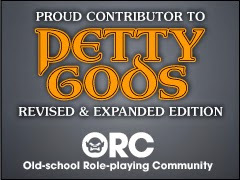 "Deities and Demigods" had been renamed to "Legends and Lore". 60 Minutes did their hatchet job on D&D. We were deep in what many have called the "Hickman Revolution" and indeed the third Dragonlance novel, last of the first trilogy was published. 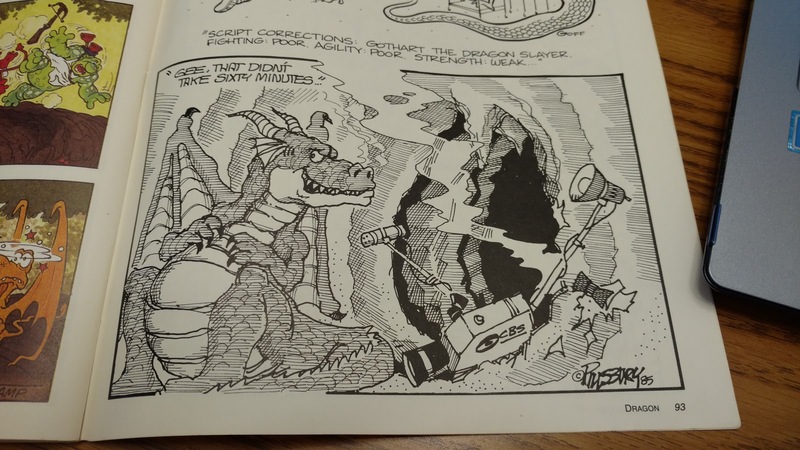 1985 gave us a little peek at what 2nd Edition AD&D would have been like and it would see the departure of Gary from TSR. A lot of this can be seen in November 1985 and in issue #103 of This Old Dragon! While there is a loose theme here, the real theme of this issue is a glimpse into the future. But first, let's start with the cover. My copy is missing the cover so I had to pop in the old CD-ROM to see it. It's a cool blue dragon that reminds me of earlier covers. I don't remember it at all really. The Letters section covers the old "Photocopying service" Dragon used to offer. Anyone take advantage of that? 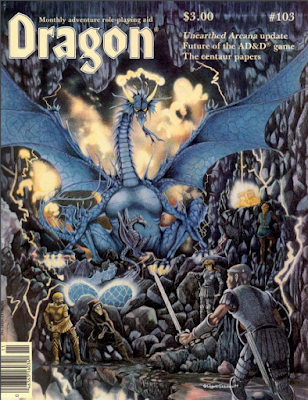 Also starting next year (1986) Dragon will be $3.50 an issue. Gary is up in one of the biggest "What If" scenarios we have all talked about. That is "What if Gary Gygax had designed AD&D 2nd Edition?" We will never really know, but there are some tantalizing bits in this month's From the Sorceror's Scroll. The Future of the Game talks about how now that UA and Oriental Adventures are now out the game should evolve to a 2nd Edition. He planned out the publication order to include the new Monster Manual, Player's Handbook, DM's Guide and a new Legends and Lore (a name he very much opposed). 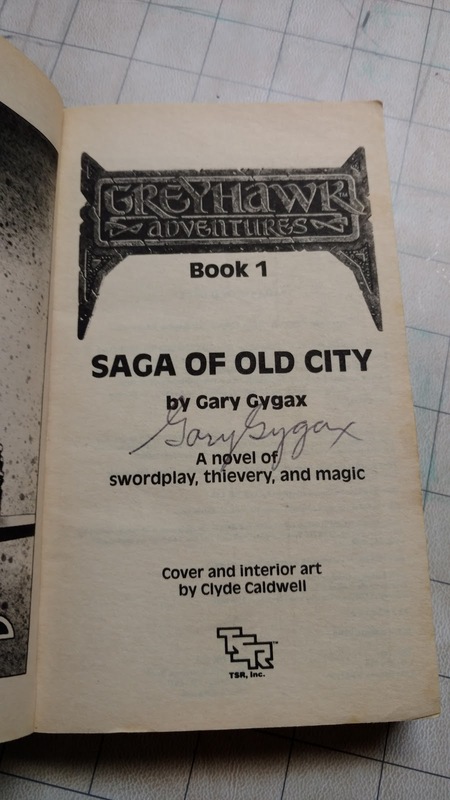 It should be noted that here Gary also says that a 3rd and 4th editions (or more) are not only inevitable but also desirable as the AD&D game is "vital. It grows and it changes". He said there is no likelihood that the AD&D rules will ever be set in stone. BTW, if you want to get an idea of what AD&D 2nd Edition as-written-by Gary Gygax *could* have looked like check out +Joseph Bloch's Adventures Dark & Deep. He spent a lot of time researching and this article was the genesis of that. Kim Mohan is up with updates for Unearthed Arcana. We had a rule in our games, that if it was in the books it was law, even if the rule was obviously "off". We did it this way to avoid rule-lawyering arguments over intent. Plus the book was an impartial party. It didn't change based on the situation at hand. So I can't recall if we used any of this errata or not. There are many reasons why people don't play gnomes. I think this is one of the biggest ones. All About Krynn's Gnomes from Roger Moore details the "Tinker" gnomes of Krynn. Of course, this is also why my brother, who is now an engineer, only played gnomes. 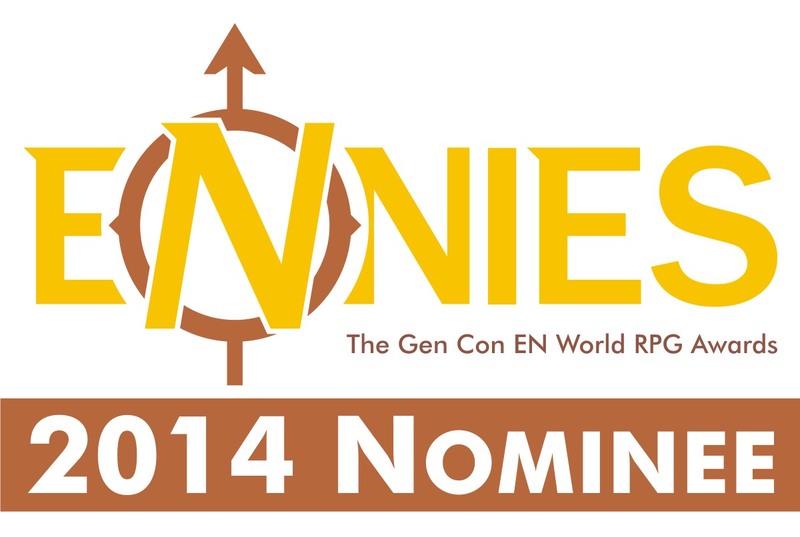 I have to admit I REALLY disliked the Tinker Gnome idea and I hated the execution of the idea. An entire race prone to failure and explosions? You know what we call that right? Extinct. Honestly, it was not till 3e that I could even look at gnomes again and really not till 4e that they became something I'd consider having a character for. Like Dogs? Stephen Inniss seems to with a collection of 12 domestic breeds in A Dozen Domestic Dogs. My favorite bits are on the armor for fighting dogs. The Role of Books covers a few books I am not at all familiar with. Though there is one, "Dragonlance, Dragons of Spring Dawning" that everyone knows. One, "The Song of Mavin Manyshaped" by Sheri S. Tepper sounds interesting. An ad for Palladium's Teenage Mutant Ninja Turtles & Other Strangeness is next. Long before there was a cartoon there was this game. Talk about striking when the iron is hot! Stephen Inniss is back. He had submitted an article on centaurs at the same time another author, Kelly Adams has submitted an article on centaurs. The resulting article, The Centaur Papers, is a combination of these two works. They fit together nicely (deft editing) and produce a long article, but what must be considered to be the Master's Thesis on Centaurs in D&D. At 11 pages it is no small article. Every so often I run into someone that is really, really into some concept in the game. I remember back in the 90s stumbling upon a website dedicated to the Bariaur race, others for different things. This article reminds me of that. Just detail on detail. 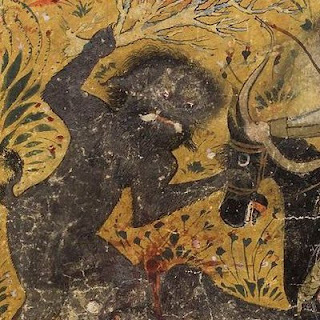 If you are into centaurs at all then this is your "must read" article. Our centerfold is a collection of errata and corrections for Unearthed Arcana. TSR Previews lets us know that Oriental Adventures and Saga of Old City are on the way. This is followed by TSR Profiles of Gary Gygax himself. The Wages of Stress is the fiction bit for this issue. It takes place in the fantastic future world of 2007 when everyone is connected by computer. Ok, not to be too glib about it there is a bit about how everyone's health can be monitored remotely. A Traveller article on the planet Tarus is up first. Of Nobbles and Men by Paul Vernon. He had some great White Dwarf articles around this time as well. The Saurians is the article I used the most from this issue. A race (with subraces) for Star Frontiers I mixed them in with the Sea Devils and the Silurians from Doctor Who to make a race of "Saurials" that I used in many sci-fi games and then later used again in D&D. Plus it was easy to add in bits of UFOlogy to this with their Reptoids. Roger E. Moore has a review of the Gen Con 18 designer's forum on Supers RPG in A Super-Powered Seminar. A brief history of supers games is discussed here and what the future mught hold. The Marvel-Phile covers three heroes I know nothing about; Armadillo, Count Nefaria and Hyperion. Ads...Convention Calendar...Wormy and Snarf Quest. Dragonmirth gets in a dig at 60 Minutes. Issue #103 was not a bad issue, just not a memorable one for me. Some memorable articles and a tantalizing article on AD&D 2nd Ed. Curious about what White Dwarf was doing at the same time? Check out my White Dwarf Wednesday for issue #71. Also, the success of the TMNT RPG was actually in full force BEFORE the cartoon, as it was based on the black & white comics, that came out around the end of 84 or beginning of 85. I remember buying comic #1 (2nd printing) and first printing of #2 at cover price off the shelf in that time period. By the 90s, before the bubble burst, they were worth around $125-200 each - just in time for someone to break into my house and steal my most valuable comics (they literally went through 2000 comics and stole the most valuable 100 or so, leaving the rest). In fact, it was the TMNT cartoon that killed the RPG, as the cartoon redefined the turtles as "kiddie fare" - sales died off, and a 4-5 year long attempt to solicit a COMPLETED second edition of the RPG to distributors died (they had more pre-orders from fans than from distributors). 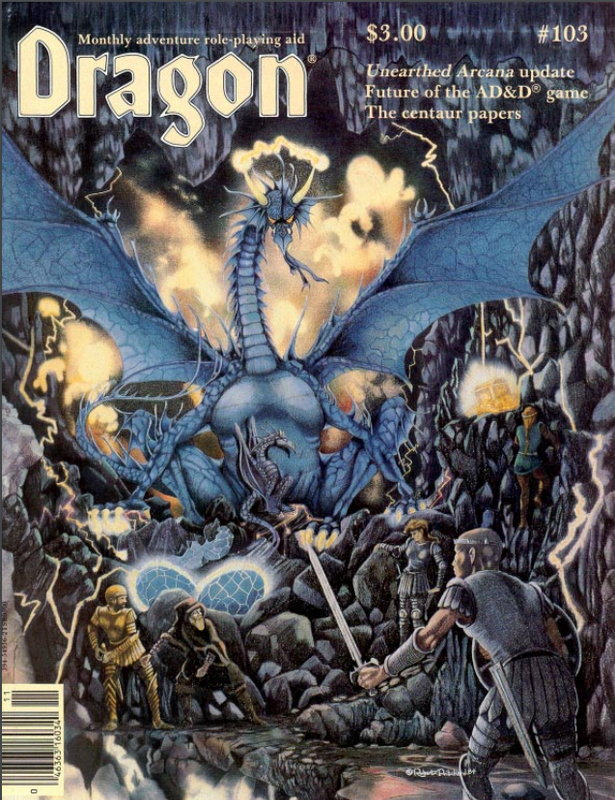 This was the first Dragon magazine I ever owned, given to me on my birthday as the tangible representation of a year's subscription. Ah, nostalgia. What really struck me in this issue was how few and how long the articles were. Very different feel from the old Dragons I've read recently.